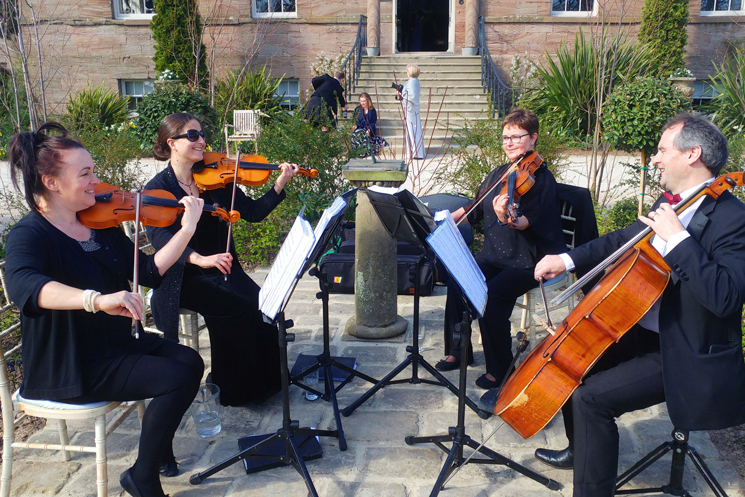 North East Soiree String Quartet is one of the North East region's leading professional String Quartets. Formed in 2002 it provides music for weddings, parties, birthdays, functions and corporate events. The String Quartet performing Over the Rainbow (IZ version) live at a wedding at Matfen Hall in Northumberland as guests enter the hall before the wedding starts. Faure's Pavane played live at a wedding in Langley Castle, Northumberland. This piece was stopped at a suitable point when we got the cue from the Langley Castle management that the bride was ready to enter. Our String Quartet playing Bollywood music Tu Hi Meri Shab Hai from the film Gangster at a wedding in Redworth Hall, Newton Aycliffe. If the music doesn't play, click here for mp3 samples on a pdf document.